No exaggeration but last week I think I may have had the best meal of my life. Paul Ainsworth at No.6 has been on my restaurant wish-list for a while and after seeing him present a Christmas cookery programme on BBC1 last December I finally took the plunge and booked a cheeky midweek break for me and hubby down in Padstow. Yes I know it’s in Cornwall and this blog is about Devon … but rules are there to be broken or so my Aunty Betty used to say. 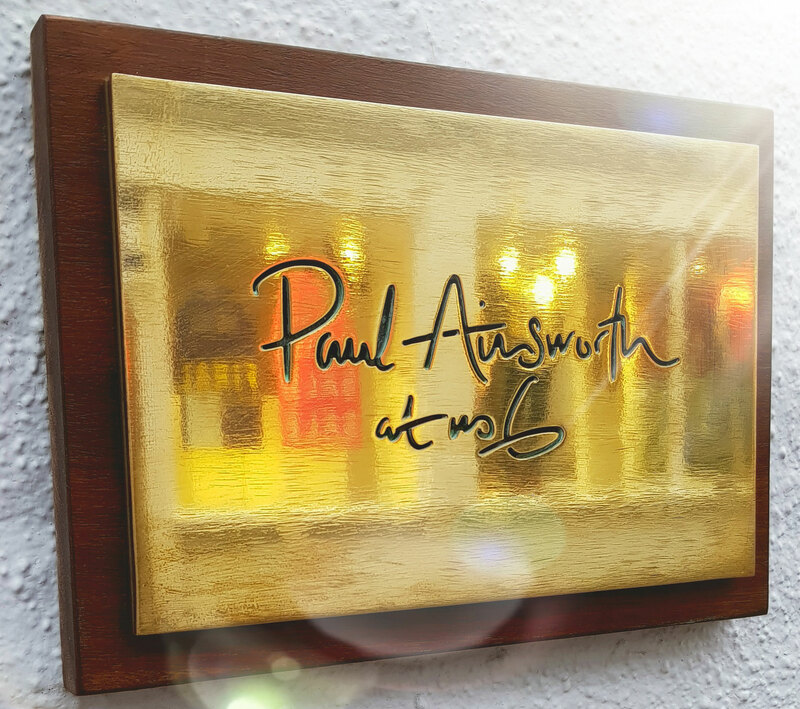 From the moment you step into Paul Ainsworth at No.6 you know you are in for something quite special. Just inside the lobby is the Florence Parker private dining room beautifully decorated with a colourful and striking Escher-esque wallpaper, feature lighting and elegantly laid table. 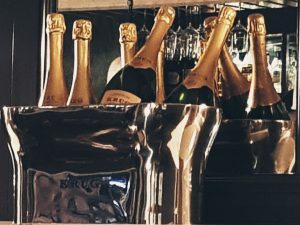 The elegance continues upstairs in Cici’s bar (named after Paul & Emma’s daughter) the style of which which we dubbed colonial chic – think mottled glass mirrors, leather club armchairs and hammered metal tables. In contrast, the walls are peppered with modern paintings and sculptures by likes of Tracey Emin and Maria Rivans (whose work we had seen that afternoon in the nearby Drang Gallery at eye-watering prices!!). 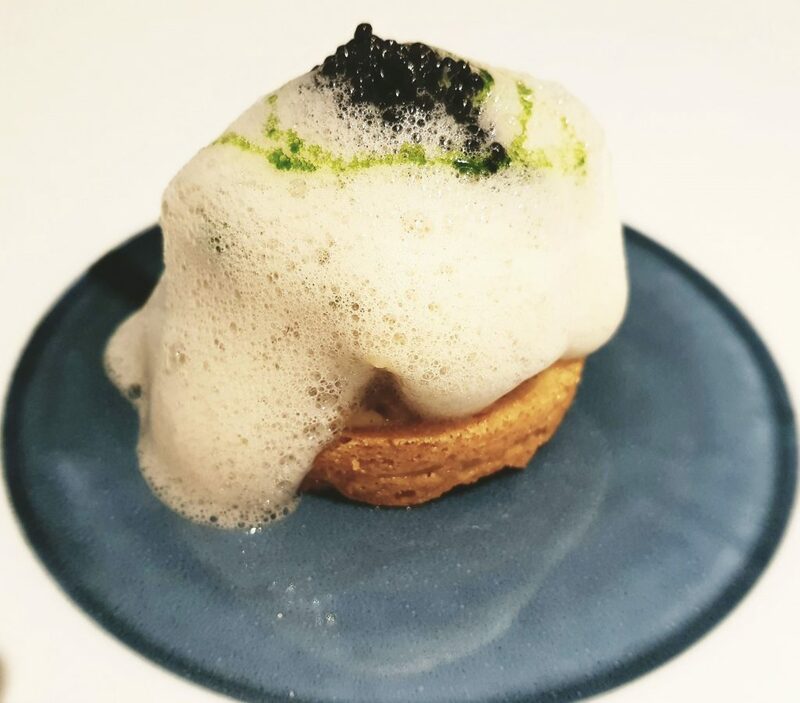 Our amuse bouche was a deep fried crispy Porthilly oyster served with a lightly whipped horseradish cream sprinkled with powdered seaweed. This was presented in an oyster shell perched on a bed of seashore pebbles. Alongside this was some fresh sourdough bread accompanied by a selection of home-made butters including an intriguingly salty yet sweet (and very moreish) caramelised version. Hubby chose the Pig’s Head Fritter – which elevated this humble cut to something quite extraordinary. 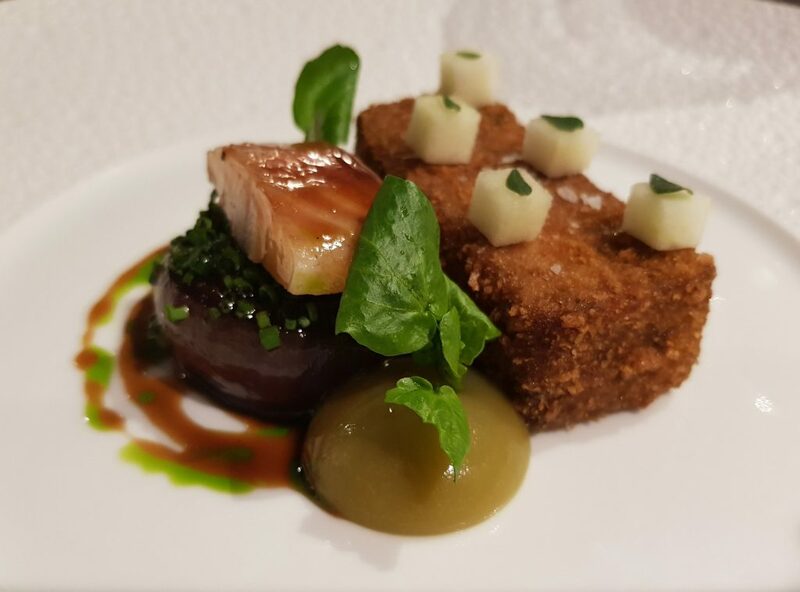 The crispy fritter (like a deep fried compressed terrine) was served alongside a meltingly soft red onion, sharp bramley apple puree and a chunk of smoked eel. Perfectly cut tiny cubes of apple sat atop the fritter and the whole thing was brought together with a silky smooth sauce. Mains took a little more time to choose as we were rather tempted by the Fillet of Beef with Bacon Mousseline but as this dish served 2 we thought it would be nicer to be able to sample each others dishes – no not greedy, just inquisitive! I decided on the Chicken “Tournedos Rossini” – a fowl version of the traditional beef dish. Nothing I can say about this will do it justice. It was just simply the most beautiful thing I have ever tasted. 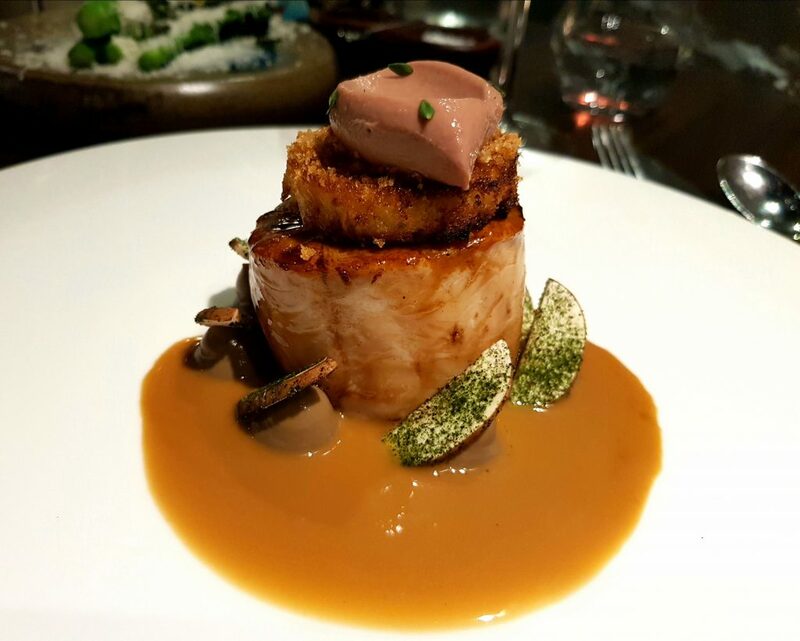 In essence it is a succulent chicken “fillet” topped with a brioche crouton and a perfect quenelle of chilled chicken liver parfait, which gives an intriguing temperature contrast. It is accompanied by slivers of mushroom and the richest, silkiest most delicious sauce I have ever tasted. Now let me make this clear – if anyone can teach me how to make a jus of this quality, with that depth of flavour I will give you my life savings (not a huge amount I grant you but it’s the thought that counts). Hubby’s choice was no less inventive and equally as sensational. The very simply entitled Hogget was in reality a complex slow cooked lamb pudding clothed in a thin suet crust and served with an intense garlic and red wine ketchup. 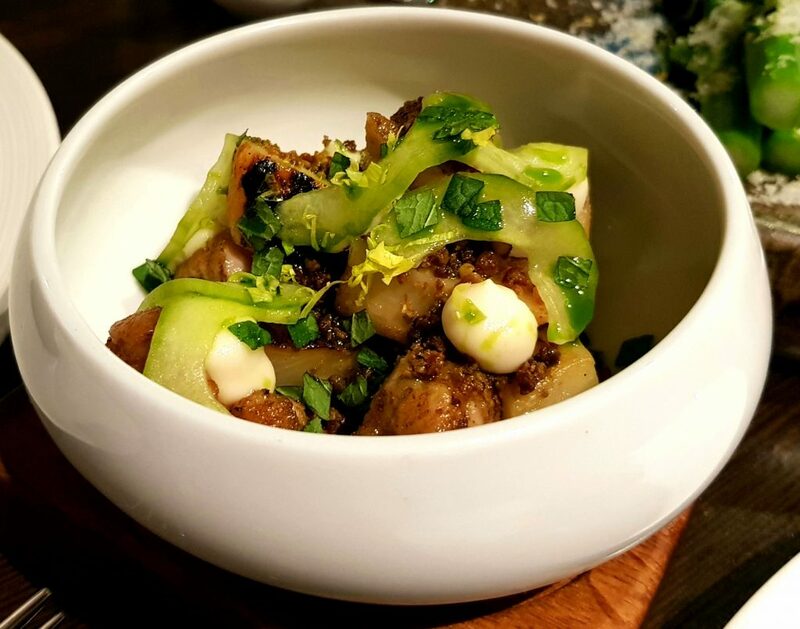 But we both agreed that it was the fricassee side dish consisting of meltingly soft sweetbread, salt baked celeriac and celeriac puree that was the surprising star of the show. Those of you who remember the early days of the Great British Menu will recall that in 2011 Paul got through to the banquet with his dessert “A Taste of the Fairground”. 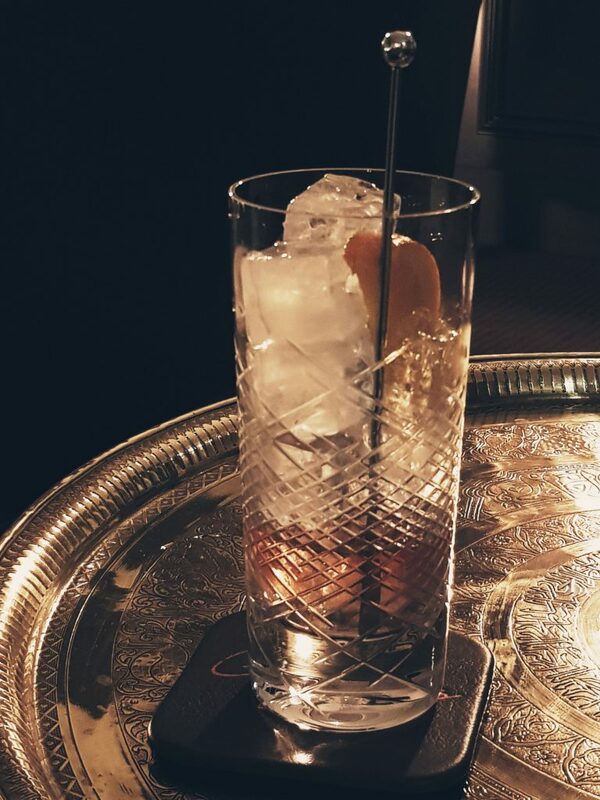 It’s no surprise then that this has recently been reinvented and now appears at No. 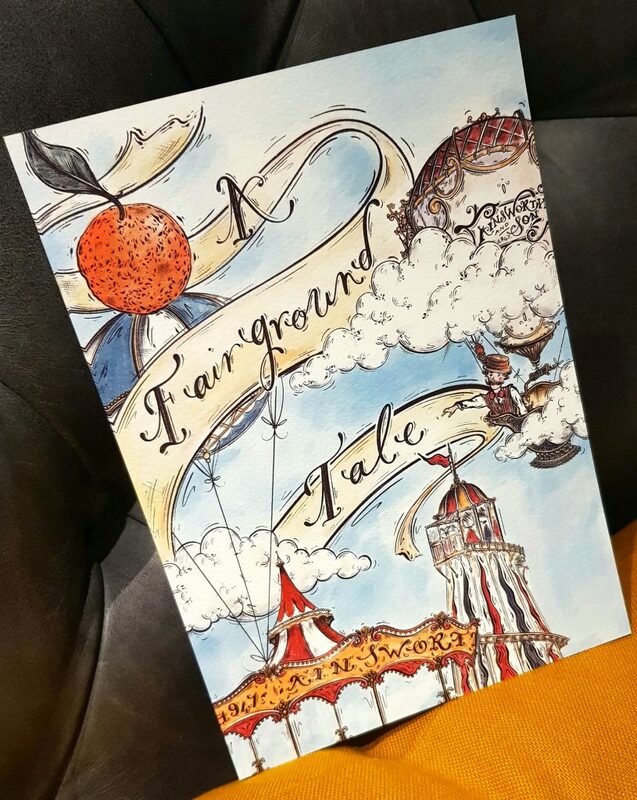 6 as A Fairground Tale. 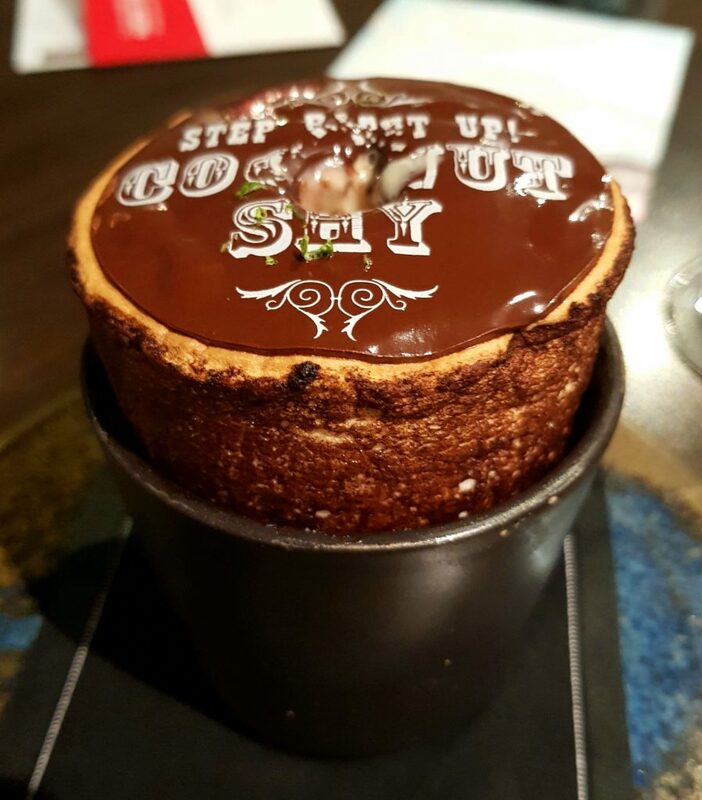 It was a surprise, however, to discover that it is actually a trio of puddings … but “wow” … what a way to end an already unforgettable meal. The first offering was an Old Tyme Coconut Shy, a light-as-a-feather coconut souffle into which was poured a custard made from Koko Kanu – a coconut flavoured jamaican rum. This was done at the table, and unfortunately I didn’t manage to get a picture before our waitress had added the custard so apologies for the image below! 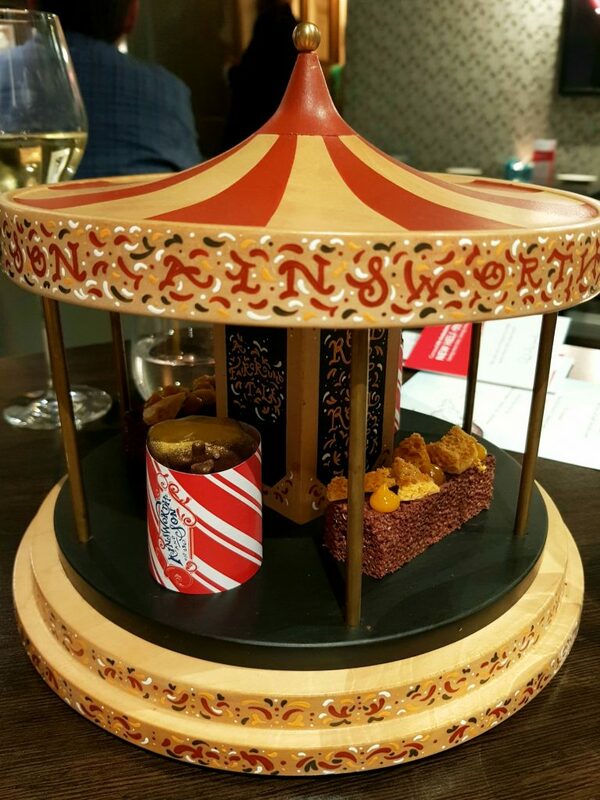 The next thing ceremoniously delivered to the table was The Carousel : a beautifully decorated miniature merry-go-round which housed two amazing puddings. The first was an aerated chocolate slice made from Itakuja chocolate (a new one on me too) topped with crunchy pieces of honeycomb and droplets of intensely zingy mandarin puree. The other offering was a crunchy brown butter choc-ice complete with paper wrapper which did remind me of the choc-ices of my youth! By now we really thought we couldn’t manage another mouthful. However the final pudding arrived and we figured we should at least give it a go … All the Fun of the Fair consisted of about 6 miniature doughnuts pressed together to form a ring – a kind of doughnutty rum baba. Alongside was a vibrant scoop of raspberry curd which added that sharpness needed to cut through the richness of the muscavado doughnuts. They say it’s all in the detail and the addition of just a few salted peanuts on the top of the dish enhanced the dish even more. After this we really couldn’t manage another morsel which was a shame as the petit fours on the next table looked lovely … next time perhaps? A final mention must go to the amazing front of house team (it goes without saying that the kitchen brigade are all heroes in my eyes). Super (but not overly) friendly they are all immensely proud of working there and nothing is too much trouble. They know the menu inside out and all our queries were answered on the spot. They are a credit to the immensely talented Mr Ainsworth. 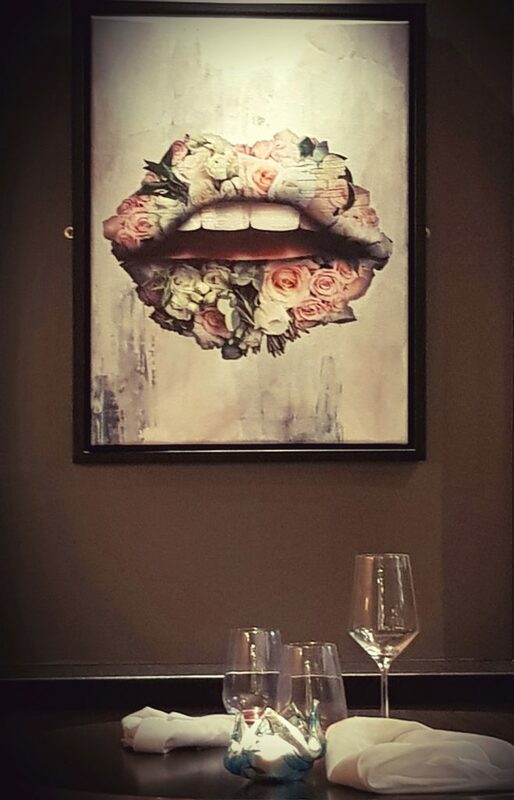 As well as No.6, Paul also owns Italian restaurant Rojano’s in the Square and a luxury boutique hotel in town. Together with his wife he is about to re-open the popular Mariners Arms in Rock and has also announced plans for a cookery school and Chef’s Table experience called Mahe later this year. So perhaps in the future we will be affectionately renaming this popular Cornish destination Paulstow instead of Padstein!! Hi there. I’m Helen, a 50 something food lover and I live in Dartmouth with my hubby and my hound! Welcome to My Delicious Devon blog. Come and join me on my foodie adventures and find out where, what and how to eat the best that Devon has to offer. Foodie loves : a proper bacon sandwich, Prosecco, fresh summer berries and anything in a pie! Foodie hates : tomato ketchup, gazpacho (long story) and anything served on a board that really should be on a plate!